I am thrilled to announce that I have been accepted into UCSF’s Masters Entry Nursing Program, which will allow me to expand my learning and apply it with what I love to do. However, sadly and with so many mixed emotions, this means in the meantime that I will stop doing my life’s work of being an herbalist. It has been an amazing decade of learning, healing, and caring for all of you. I look forward to serving you in the future as your primary care provider as a Family Nurse Practitioner with an integrative practice as a Registered Herbalist. For a list of retail locations that carry Herban Elixirs please go to my SHOP page. 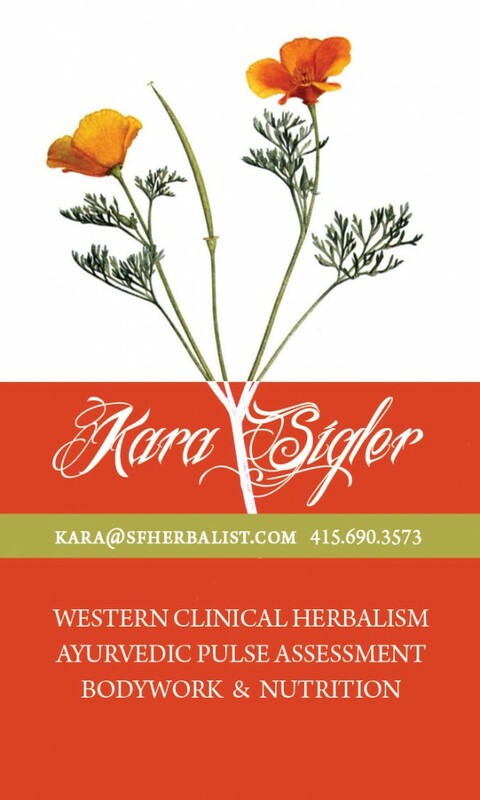 If you need a referral for another fabulous herbalist here are a few I highly recommend. If you need a referral for a body worker in the east bay here are some of my favorites. I hope to resume offering consults in August 2018 or 2020 depending on my school schedule. Check back for updates! Kara offers Herbal and Nutritional consultations, Ayurvedic Lymphatic Massage, and Pulse, tongue and facial diagnosis for clients. All bodywork will be accompanied by a consultation to have the maximum therapeutic benefit. As a wholistic practitioner, Kara addresses not only the physical but also the mental and spiritual aspects of health, illness and dis-ease. Consultations are relaxed and mostly conversational. We will get a full picture of your health history to be able to recommend the most appropriate herbal formulas, lifestyle suggestions, nutritional information, and emotional support to guide you through your healing process. Pulse, face and tongue diagnosis are employed to give us a deeper picture of the body’s process. Consultations consist of a verbal and written health history, with follow up visits and individually crafted herbal formulas for clients. Herbs are offered through Kara’s apothecary as alcohol extracts, vinegar extracts, honey preparations, topical salves, or teas. The goal of healthy living is not to be reliant on herbs for ever. Clients should expect one month of treatment for each year they have experienced a disharmony. Once a month for a 3-6 month commitment to your health will have long reaching results. Initial consults last 2 hours. Follow up consults last 1 hour. Kara practices Lymphatic massage which helps to stimulate the immune system, allow the body heal faster, relieves stress and anxiety, and cleanse the tissues of the body. This technique is helpful for healing injuries, breaking up scar tissue, flushing excess water, and keeping the life flow energy moving. Lymphatic breast massage is cancer preventive. Kara also teaches clients to do targeted self massage techniques at home to maximize their healing. A 3 hour consultation and bodywork session is recommended for first time clients to get an in-depth assessment of the disharmonies of the body. Follow up bodywork with consult last 1.5, 2 or 3 hours. Please check my SERVICES page for a list of fabulous referrals!